Relax and Silence the Voice of Your Mind, Today! Is an inner dialog always going on inside you, preventing you from getting things done, making clear decisions, and concentrating on tasks that need to be done? * Are you a student? How often do you sit down to complete some important assignment, only to suddenly find something else (of far lesser importance) to attend to? * How many times have you, in your adult life, been faced with some task or resolved to learn some new creative skill only to set it aside for some menial activity with no deadline or value? Are you looking to stop this? Are you looking for simple ways to quiet your inner voice that you can implement right now? If you are, this book is for you! In “How to Quiet Your Mind: Relax and Silence the Voice of Your Mind, Today!” you will learn techniques to quiet your inner voice, relax, focus on the here and now, and get your mind to cooperate with what YOU want. 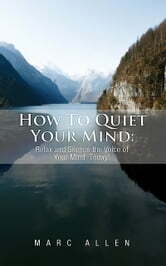 This book will introduce many of the benefits you will receive by quieting your mind. All of these are broken down into bite-sized, easy to understand areas for you to read whenever you have a few spare minutes, or just need a simple refresher. You’ll marvel at the simple yet powerful techniques contained within that can dramatically change you. This is everything you need to get started today! You deserve the absolute best for your life, and it can all start with “How to Quiet Your Mind: Relax and Silence the Voice of Your Mind, Today!"